Astoria has a lot going for it - great restaurants and cafes, proximity to Manhattan while maintaining a slower pace and cheaper rents, and plenty of tree-lined streets. But one of the best parts about living in Astoria is the plethora of parks along Astoria's East River waterfront, including the much beloved Astoria Park (park history). 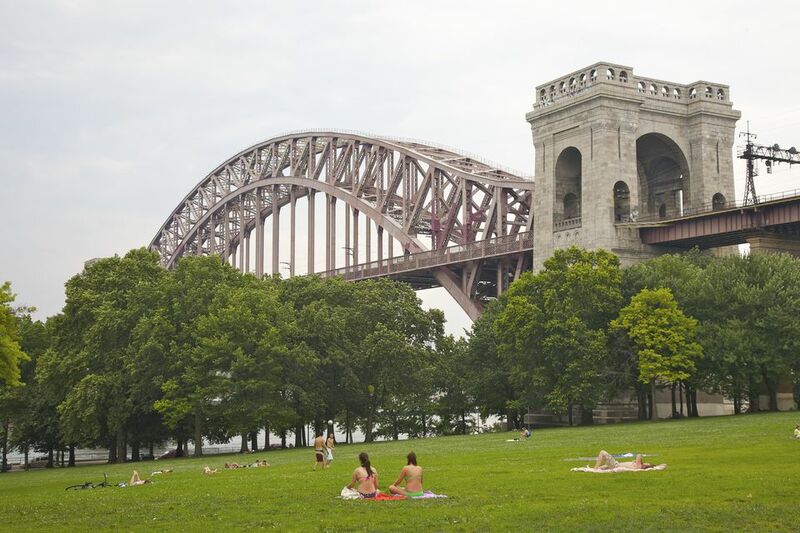 At any time of the day - morning, noon, and night - you will find people enjoying Astoria Park. Year-round, they walk and run its hilly, tree covered trails, bring their dogs to frolic with their neighbor's dogs (dogs can be off-leash until 9 a.m.), practice tai chi in the early hours, and hang out by the waterfront even on the coldest and hottest of days. Astorians of all ages love to use the all-weather track for running, walking, and socializing with their friends and neighbors. Impromptu football, soccer, and ultimate Frisbee take place at the park, too. From late June to early September, the Astoria pool is open for all to use, with free admission. It is one of the best ways to stay cool in Astoria during the summer. Adult lap swimming, lessons, and recreational swim take up the days. The pool, originally a WPA project, is 333 feet in length, which is the size of four Olympic-sized swimming pools set next to each other. That's a lot of space, and in the summer, it's all used. Two of New York City's bridges grace the park - the RFK Bridge (formerly the Triboro Bridge) and the Hell Gate Bridge. The RFK Bridge takes people in cars or trucks from Astoria to either Manhattan or the Bronx. The Hell Gate bridge takes people and freight to and from Manhattan via rail. Both are distinctive looking, though the Hell Gate Bride - a engineering marvel at the time of its construction - gained notoriety as the inspiration for the Sydney Harbor Bridge in Sydney, Australia. The Astoria Park track is host to people doing their regular workouts, community organizations, and organized events. The Hellgate Road Runners and Astoria Elite Weekend Joggers often start their group workouts there. Each year, the American Cancer Society holds its Relay for Life, a 24-hour walk/run event, at the Astoria Park Track. From the track there are great views of the majestic RFK Bridge, too. Adjacent to the Astoria Park track is the newest recreational spot, a skate park. It has become quite a destination for skateboarders all over the city. Instead of a bowl configuration it's flat with elements that rise up from the ground, giving skaters (and some BMX bikers) opportunities to challenge themselves on four (or two) wheels. In summer of 2011, the first Astoria Carnival came to Astoria Park. Erected in the parking lot, this multiple day event drew people from all parts of Astoria. Amusement park rides and carnival food galore overtook the park. Those who rode the rides got amazing views of the East River and Manhattan. Astoria Park is the host for many arts events in the summertime, too. There's a film festival and a concert series that is free for the community, organized by the Central Astoria Local Development Coalition. In late June, Astorians are fortunate enough to have their own fireworks show, too. People arrive with blankets, food, friends, and family, spread out on the great lawn, and enjoy the time together before the big event, which is always fun. Astoria Park has its own volunteer-run organization, the Astoria Park Alliance, which was formed by concerned community members to help care for the park. The volunteers organize shoreline and park cleanups, teach park users how to care for the park via the NYC Park Greeters program, and have helped bring more trash cans to the park. The Astoria Park Alliance also organizes and produces the Astoria Park Shore Fest, which happens each August along Shore Blvd. Three successive Sundays in August the street, which borders the west side of the park, is closed to motorized traffic, and the community gets to enjoy that part of the park uninterrupted by cars. Members of the Astoria Park Alliance have developed a butterfly garden under the Hellgate Bridge, too. This mini-garden is full of plants specifically picked to attract butterflies. Community weeding and gardening times are set during the late spring and summer. Throughout Astoria Park are a number of monuments and tributes. These commemorate our veterans and those who have tragically died. The north half of the park holds the majority of these important spaces, and are worth visiting and recognizing. Astoria Park - one of the best reasons to live in Astoria!